I was trying to picture what are the characters that always show up during Christmas time. Of course, Rudolph the red nosed reindeer is one of the famous Christmas icons. So today's bento is once again inspired by my Christmas spirit. Many malls, shops, and cafes are decorated with Christmas theme already. Unfortunately, I never see big window showcase for Christmas at the big malls here. Something that I always love when I traveled to overseas during Christmas time. Inside the box : rice, cherry tomatoes, stir fry veggies (carrots, bean sprouts, leak) with wood ear mushroom, fried boneless chicken thigh with homemade yellow Indonesian spices. Kids are excited for Christmas holiday but first they will have to do their 1st semester final exam first next week. 2 weeks after the final exam then they will have school break until January. We don't have so many school breaks here. Only on December/January and June/July. So kids are looking forward for the break soon. Just to remind you, if you love bento making please don't forget to join Bento Contest held by Cooking Gallery. You can read the details here. I know some of you probably busy cooking and preparing for Thanksgiving. I would like to say Happy Thanksgiving to all of you who celebrate it! I love Rudolph! We like to watch the show every year. Yours are so sweet and cute ! @sheri fujihara chen : Only remember Rudolph and forgot about the others reindeer's name hahaha ... I'm not sure that my kids can recall all the name of Santa Claus' reindeer too. Thanks a lot Sheri! aww.. always love your bento, this is so festive and love the colour of the veggies.. just like Christmas tree and wreath! Just one word to describe anything made by you: cute! Ah too cute! Love your holiday themed bentos Lia! There's so much detail in them.. 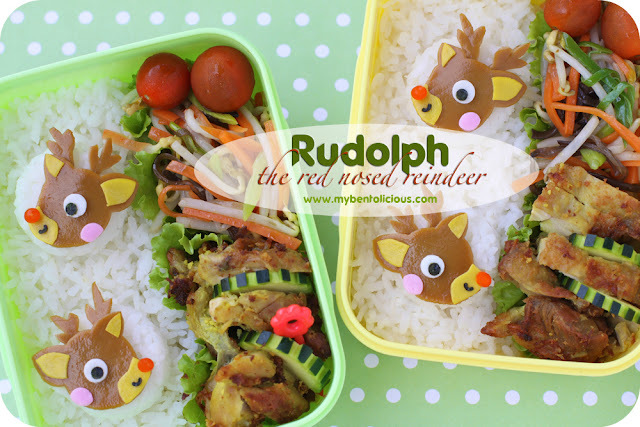 This Xmas-themed bento is SUPER adorable!! I love everything in it :). It's funny how I still don't feel that Christmas is coming even though everywhere I go I see Xmas decorations now. Probably in December when I visit the Christmas markets... I love German Christmas markets, they're so cool :). @ChantaleP : Kids were happy with Christmas theme, so probably I will make some more later. Thanks a lot Chantale! @melonpan : Thanks a lot for your sweet comment! They are so wonderful! I am so jealous of your beautiful egg sheet skills :-D I hope that your little ones didn't stress out too much over the exams. hai, i like your bento a lot.. may i know where you bought the jelly ball for the reindeer nose?